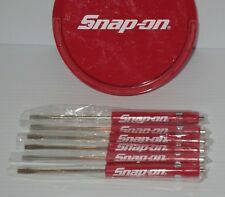 NEW Snap On 5 Pc. Set 1/4" Dr. Shallow Swivel Impact Sockets 5/16" to 9/16"
NEW Snap On 5 Pc. Set 1/4" Dr. Shallow Swivel Impact Sockets 5/16" to 9/16". 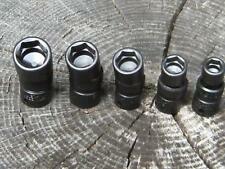 shallow swivel impact sockets in sizes. • Heat treated to a lower hardness adds impact resistance and toughness, which allows a longer socket life. RULER NOT INCLUDED. NO OWNER ID MARKS. (5)FIVE Snap on Pocket Screwdriver, Flat Tip Screwdrivers, RED ~ Magnetic .NEW. Red Hard Handle Screwdrivers with Magnetic End & Pocket Clip. FLAT TIP POCKET Promo SCREWDRIVERS. THESE ARE THE PROMO SCREWDRIVERS FROM THE SNAP-ON TRUCKS. F720(A), F724, F726(A,B), F730(A), F731(A), F732(A), F734(A), F735(A,B), F751(A,B), F752(A,B),FK720(A), FK731, FK735, FL720(A), FL721(A,B), QJFR65A, QJFR125A, QJFR275. It does not service the flex joint or locking flex joint assembly. Trending at $141.00eBay determines this price through a machine learned model of the product's sale prices within the last 90 days. (Two cutters, 1) in front and 1) in back, really cool crimper. These are the "cats a _ s". The PWCS7 now will have an "A" on the end, and may have one of the following: CFR, CFO, or CFG. Is this enough to confuse you yet?. For sale is a new Snap-On Punch Set, #KB2183. Pick Set is in MINT condition. NO CASE INCLUDED. You are buying 1 Snap On 1/2 drive RKRCS832 ratchet repair kit. Up for sale is a new Snap-On Bench Top Utility Mat. Part #2616R01. Snap-On EXD35 35 Pc. Screw Extractor / LH Cobalt Drill Bit Set. Lightly Used on One Job. See photos from details. You are buying 1 Snap On 1/4 drive RKRT936 ratchet repair kit. You are buying 1 Snap On 3/8 drive RKRA70FMA ratchet repair kit. Plier set is P/N SN90005. All made in Spain! 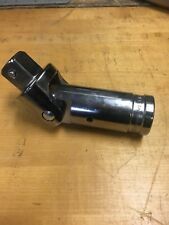 This is a new Snap On Sealed A277 crow foot holder. Used for 3/8 crow foot wrenches organization. SNAP ON TOOLS CLEAN,3/8" 6MM AND 1/2" 12MM 12 PT BIT SOCKETS. Includes storage sleeve graduated with 32th and 64th. Reverse side has a decimal fraction chart. 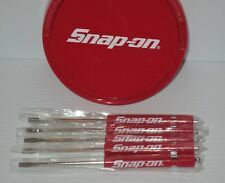 Snap On 42 pcs Rethreading Set. Condition is Used. Shipped with USPS First Class Package. Here we have a set of 9 Snap-On Screwdrivers. This set is in well used condition. All the handles show plenty of use. 87CF Diagonal Cutter - Approx. 7-1/2", Red. Snap On Ball Peen Dead Blow 24oz.Hammer HBBD24 . Condition is Used. Shipped with USPS Priority Mail. This hammer has some wear and is not perfect but not to bad used condition. Very usable. Check pics for questions good luck. Snap On & John Bean # EAA0247G21A. The numbers are raised and in Bright white to make them easy and quick to read. This caliper is made out of durable ABS plastic and will give you years of use. This caliper works with any balancer that require you to manually input the width of the wheel when balancing. My loss your gain. 4 piece set 3/8in drive extension set, 204IMXA. 9 Piece Set - the smallest one is missing. Set in very nice condition preowned. Case has some dirt on it. 71M, S71, S710, S711A, S715, SL710, SL715, SL716. The set goes from 8mm to 19mm. The set is as follows: 19mm fsm191, 18mm 181fsm, 17mm fsm171, 16mm fsm161, 15mm fsm151, 14mm fsm141, 13mm fsm131, 12mm fsm121, 11mm fsm111, 10mm fsm101, 9mm fsm91, and 8mm fsm81. 5 out of 5 stars - Snap On Red Instinct Soft Grip Pick Set. 9 product ratings9 product ratings - Snap On Red Instinct Soft Grip Pick Set. New ListingSNAP-ON TOOLS UNUSED 3 # 3/8 DRIVE LOCKING BUTTON POWER EXTENSIONS #2, 3" & 6"
SNAP-ON TOOLS UNUSED 3 # 3/8 DRIVE LOCKING BUTTON POWER EXTENSIONS #2, 3" & 6". Condition is Used. Snap On Punch And Chisel set in excellent like new condition. only a couple where ever used! F10LB Breaker Bar. You are buying 9 Snap On 3/8 drive tools for one low price - all have owner's marks removed. A2A 3/8 F to 1/2 M adapter. TA3 1/4 F to 3/8 M adapter. TMI 3/8 F to 1/4 M adapter. FXK3 extension. (5)FIVE Snap on Pocket Screwdriver, GREEN Flat Tip Screwdrivers, Magnetic .NEW. GREENFLAT TIP POCKET Promo SCREWDRIVERS. THESE ARE THE PROMO SCREWDRIVERS FROM THE SNAP-ON TRUCK. 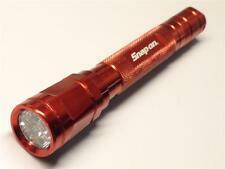 You are buying 1 Snap On 3/8 drive FC936 Stubby ratchet. Except Hawaii, Alaska and Puerto Rico. SNAP-ON TOOLS UNUSED 3 # 3/8 DRIVE LOCKING BUTTON POWER EXTENSIONS #2, 3" & 6"